Our range of products include neat cut straight cutting oil fluid. We are Providing Synthetic technology Straight Neat Cutting oil at the price of any branded water soluble cutting oil but featured with any branded synthetic water soluble cutting oil. 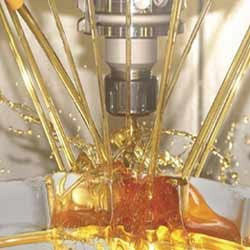 We are one of the eminent Manufacturers Processors of a wide array of Cutting Oils including Straight Oil Cutting Fluid that is formulated for light and medium conditions and is fortified with oiliness additives for supreme lubricating and cooling performance. It is commonly used for mild steel, carbon steel, nickel and manganese steel and alloys of copper and aluminum. It is acclaimed for outstanding wetting properties and facilitates better productivity. Looking for Neat Cut Straight Cutting Oil Fluid ?